How to buy the best barbecue, including choosing between gas, propane or charcoal, with barbecue materials, size options and available accessories. Are you in the market for a shiny new gas barbecue? If you are, prepare yourself for sticker shock. 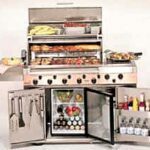 Though the price of a new gas barbecue starts at about $150, you can spend $6000 or more for a model tweaked out with every accessory under the sun. So the question is this: How do you keep from mortgaging your house to buy your new barbecue? Compact gas barbecue cooks for 6 to 8 people but is highly portable. Of course, the answer depends upon a variety of factors–some emotional, others practical. If you want to keep up with the Joneses who have the gleaming Hummer of barbecues parked on their deck, prepare to dig deep. On the other hand, if you’re looking for a barbecue that has enough features to meet your outdoor cooking needs, you can get into the game by spending $300 to $500 for a respectable model. The key is not to buy more barbecue than you need. To do this right, you’ll need to determine before you shop how your new barbecue will be used. How often will you cook on it and for how many people? Will you want to fry and saute’ or broil on a rotisserie? If you want to be able to do a variety of tasks, you’ll need equipment that can handle them. If you just want to grill dogs and burgers, there is no need to spend the big bucks for a unit that could deep-fry Big Bird. 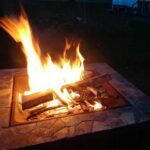 Gas barbecues may be fueled either by liquid propane (LP) or natural gas. Choose natural gas if you have a nearby natural gas supply hookup because it will eliminate the need to buy or refill LP tanks–and you’ll never run out of fuel in the middle of a barbecue party. If natural gas isn’t readily available and you want to keep the hook-up simple, choose liquid propane. Full-blown stainless outdoor kitchen has everything including a refrigerator. 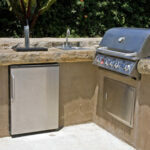 The cart and body of a barbecue firebox may be made from stainless steel, cast aluminum or painted steel. Stainless steel looks great and is highly resistant to corrosion, but it can yellow over time, especially if you don’t cover it when it’s not in service. Painted steel will rust if (or when) the paint scratches or peels away. A cast-aluminum body is tough and will not rust. 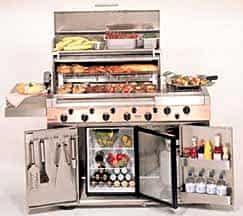 The more expensive grills are primarily made from stainless steel, with stainless-steel burners and handles, and dual-layer stainless-steel hoods that help keep the heat inside–and the cool air outside–the barbecue. Grates make a difference in performance. Cast-iron grates–whether they’re porcelain coated or not–do a good job of retaining heat, so they’re a solid choice for searing meats. To prevent rusting, uncoated cast-iron must be oiled. Porcelain-coated steel grates are not quite as effective as porcelain cast-iron grates at retaining heat. Heavy-gauge stainless steel is excellent because it retains heat well, is extremely durable and will not rust. Best of all, it’s very easy to keep clean. The size of the grill almost always directly affects price. For big parties, you’ll want a big barbecue. Some models have more than 800 square inches of cooking area. If you occasionally entertain large groups, you’re better off opting for a barbecue with a medium-to-large grilling area–490 square inches is enough room to cook from about 25 to 30 burgers at once. A smaller grill, say 350 square inches, will handle cooking about 15 burgers at one time–more than enough for most family gatherings. Barbecues that cost from $500 to $1500 often have a rotisserie burner and generally have from 450 square inches to 850 square inches of total cooking surface. Those priced under $500 are more likely to offer from 350 to 600 square inches. Also keep in mind that, if you want a barbecue that can handle big crowds, you’ll need plenty of preparation area and you may want a unit that includes side warmers and/or warming racks to keep some dishes toasty while you’re grilling others. The more independently-controlled burners a barbecue has and the more variable its controls, the greater the potential heat output and cooking flexibility it will offer. Heat output is measured in BTUs (British thermal unit)–the higher the BTUs, the hotter the sizzle. The number of burners and their particular design will determine the BTUs delivered by a particular barbecue. Most barbecues have from one to four conventional burners that, depending upon the model, are rated together at from 25,000 to 60,000 BTUs. As a standard of measure, a 44,000-BTU unit is considered “hot.” A 60,000-BTU model is blazing. Side burners are typically from 10,000 to 12,000 BTUs. Burners are typically cast iron, steel or stainless steel. 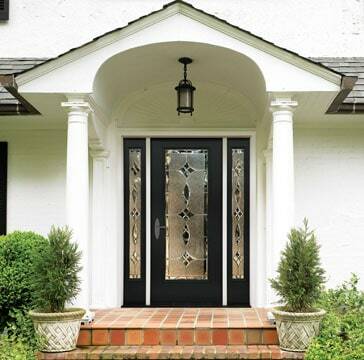 Stainless steel is considered top of the line. 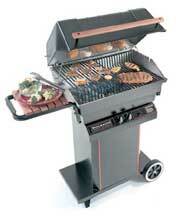 Most grills come with electronic igniters. Also consider whether or not assembly will be required and, if it will, how difficult this will be. Some grills are easy to put together without tools. If it looks like the one you’re considering will require an engineering degree, you might want to opt for another model or ask about buying an already-assembled floor model. 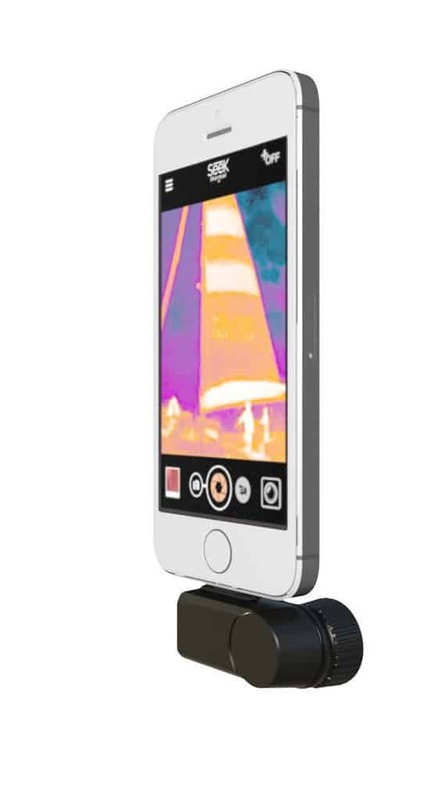 Who knows, you might even get the floor model for a discount, particularly if it’s a little shopworn. If you think you may want to broil foods on a rotisserie, be sure the barbecue you’re considering comes with or will accommodate a rotisserie set. The hood should have a temperature gauge that’s easy to read. Fold-up tables are excellent for counter space when you need it. Also consider a stainless-steel meat thermometer and condiment/utensil hooks or holders. 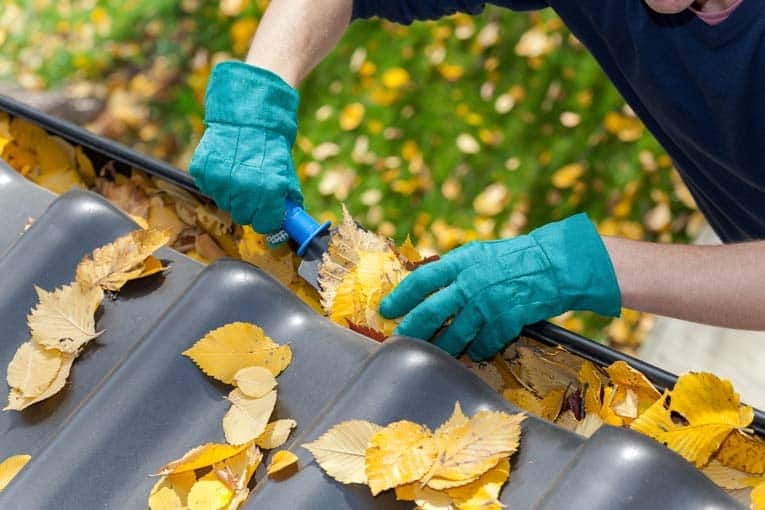 Be sure to compare warranties, especially those that cover mechanical failures. The best of the bunch have limited lifetime warranties.